Radiography of Clavicle is routinely done in radiology department in both AP and AP axial projection. Fracture and dislocation is demonstrated if present. Clavicle can be palpated in the medial aspect of jagular nocth and in lateral aspect of acromioclavicular joint above in your patients shoulder. Perform radiograph with the patient in an erect or supine position with arm at sides, chin raised, and looking straight ahead. Posterior shoulder should be in contact with IR or tabletop, without rotation of body. Center clavicle and IR to CR. 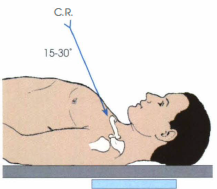 Suspend respiration at end of inhalation (Helps to elevate clavicles). The radiograph may also be taken as a PA projection and/or a PA axial with a 15 to 30 degree caudal angle. Thin (asthenic) patients requires 10 to 15 degree more angle than do patients with thick shoulders and chest (hypersthenic). Collimation border should be visible with entire clavicle visualized, including both AC and sternoclavicular joints. Correct angulation of CR will project most of the clavicle above the scapula and ribs. Only the medial portion of the clavicle will be superimposed by the first and second ribs. 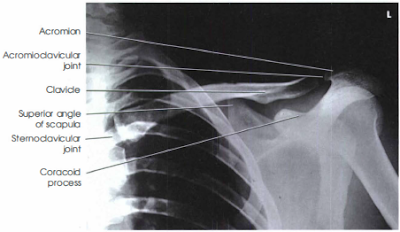 Optimal exposure will demonstrate the distal clavicle and AC joint without excessive dnesity. 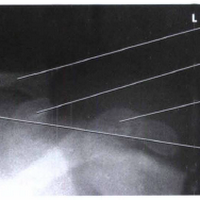 AP Axial clavicle of 3 year-old child, showing fracture (arrow). 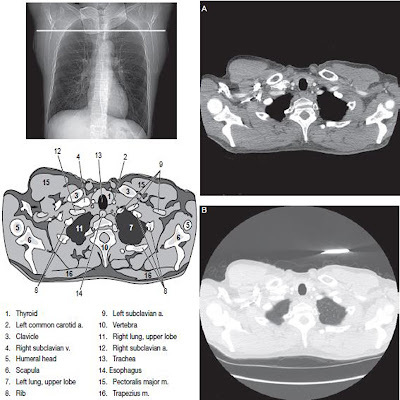 The bony margins and trabecular markings should appear sharp, indicating no motion, and the medial clavicle and sternoclavicular joint also should be visualized through the thorax.